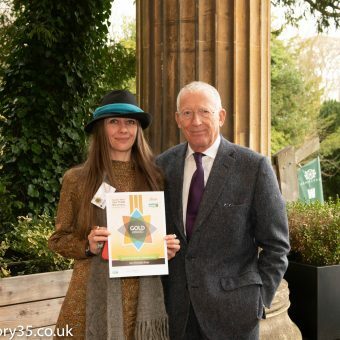 Nick Hewer presents Amy Lawson with the Gold Award at the South West Fairtrade Business Awards. Over the course of 13 years, Amy Lawson has turned her passion on all things organic, recycled, up-cycled, fair-trade, and environmentally-friendly into a growing, eCommerce eco-friendly product supply business. With ambition to increase online sales, Amy was eager to find a way to compete with larger, more established eco-friendly online retailers whilst maintaining her current cost threshold. Following a discussion with Heart of the South West online adviser, Nicky Rees, the Mendip-based business was referred into the Heart of the South West Growth Support Service which included a 1-to-1 business support session with Neville Marchent, one of the Growth Hub’s network of specialist Business Advisers. Since concluding her support session, Amy has gone on to win the gold award, for ‘Best Multiple Products Retailer’ at the South West Fairtrade Business Awards. “Following the session with Neville, I feel quite positive again about my business. – Social media marketing support with specific reference to Facebook marketing where Amy has an established, growing customer-base. – Help developing an ongoing and time-efficient SEO and back-linking strategy between the business’ website and social media accounts. – Guidance on the Eco-Friendly Shop’s key messaging, including how to further promote the business’ values, ethos and mission statement, as well as campaigns to boost social and blogging content. As something of a Thought Leader on the best eco-friendly products on the market, Amy is working on further establishing ties with the British Association of Fairtrade. The business has acquired new social followers following an online referral from the Association. Guidance from HM Government on business support which include an extensive range of content and tools covering a range of business sectors, issues and themes. Referral to the Business is GREAT Britain online guidance which includes information and tools for starting, growing or accelerating a business. Amy was also provided with further information about the Access to Finance programme, a HM Government and BBfA partnership initiative. The Eco-Friendly Shop is set for growth and the business was recently recognised at the South West Fairtrade Business Awards where Amy was presented with the Gold Award, for Best Multiple Products Retailer. To find out more about the Heart of the South West Growth Hub service or to access fully funded (yes free!) advisory support from a business adviser visit the Growth Hub website.